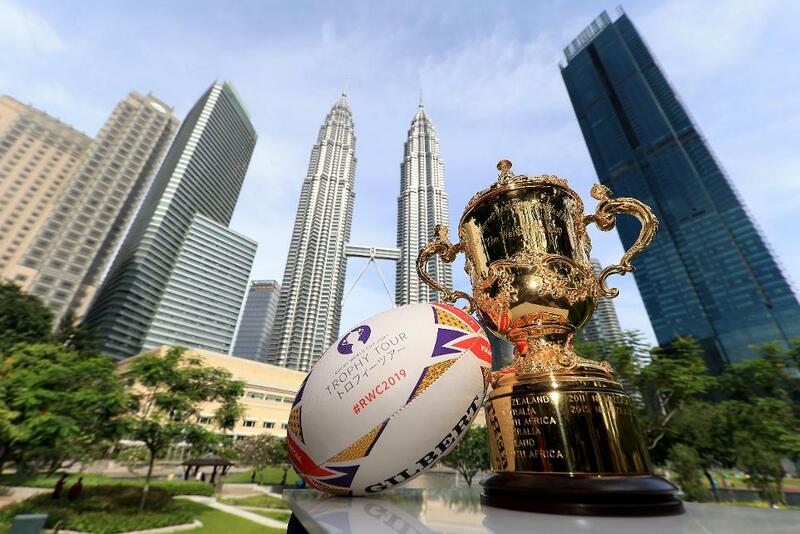 More than 3,000 people Get Into Rugby as the Webb Ellis Cup visits Malaysia for the first time as part of the Rugby World Cup 2019 Trophy Tour. On Sunday, 20 January more than 3,000 people celebrated the Webb Ellis Cup’s first visit to Malaysia at a Get Into Rugby festival in Kuala Lumpur. As part of the Rugby World Cup 2019 Impact Beyond legacy programme, 18,000 people in Malaysia have had their first taste of rugby. In December it was revealed that the programme had reached its target of one million new participants in Asia. With eight months to go until Rugby World Cup 2019, Asia Rugby and the respective unions continue their hard work to grow the game and focus on the retention of players in the sport for the longer term. The Get Into Rugby festival in Kuala Lumpur was hosted at Sekolah Menengah Sains Selangor (S.M.S.S), with 125 teams from schools around the country taking part in a two-day sevens tournament. The competition included girls’ and boys’ teams, with ages ranging from 11-19, demonstrating the continuing growth in popularity of rugby in Malaysia. On Saturday, 19 January the trophy arrived in Kuala Lumpur to a colourful royal welcome, when the King of Malaysia, Sultan Nazrin Muizzuddin Shah, hosted a special gala dinner. The event, which was organised by the Malaysia Rugby Union, saw players, officials and supporters celebrate the success of rugby’s development across the country. World Rugby Chairman Bill Beaumont said: “The Rugby World Cup Trophy Tour is playing an important role in breaking new ground and inspiring new rugby participants and fans across the world. It was fantastic for the Webb Ellis Cup to visit Malaysia for the first time ever and we are grateful to the King of Malaysia, Sultan Nazrin Muizzuddin Shah, and the Malaysia Rugby Union for giving the trophy such a warm welcome. During the final day of the tour, the Webb Ellis Cup visited Kuala Lumpur city centre’s iconic Twin Towers and Malaysia’s federal administrative centre in Putrajaya. Later in the day, Official Logistics Partner of Rugby World Cup 2019, DHL delivered Get Into Rugby kit to students from Sekolah Menegah Kebangsaan. Saturday also saw tickets for Rugby World Cup 2019 go on general sale to the public, operating on a first-come-first-served basis, in real-time. Following record-breaking demand for tickets during the ballot phases in 2018, a limited number of tickets remain available and fans are encouraged to use the ticket availability indicator on the ticketing website to give themselves the best opportunity to secure Rugby World Cup 2019 tickets. Tickets can be purchased via www.tickets.rugbyworldcup.com. Malaysia was country number 12 on the 20-nation journey and the second stop in 2019. It was the sixth time the famous trophy has visited Asia on this tour, with previous stops including Hong Kong, China, the Philippines, India and Nepal. The next stop will be Germany in February as excitement continues to build for Asia’s first Rugby World Cup in Japan. Later in the year the Webb Ellis Cup will visit South Africa, USA and Canada, Brazil, and Chile among other destinations in the lead up to the tournament. To view the Rugby World Cup 2019 Trophy Tour schedule, visit www.rugbyworldcup.com/trophy-tour. For more detail on Rugby World Cup 2019, visit www.rugbyworldcup.com.